For 9-11 year olds the emphasis is on court movement, basic stroke technique and match play. Orange Level focuses on developing an all-court game and on learning to transition to the net. Players work on developing groundstrokes with correct swing patterns, learn topspin and slice, volleys and overheads, correct technique for serve and return, with a focus on using the correct grips and the ability to hit to targets. Players will stay in this level for about two years as they progress through all the skills required to master this level. 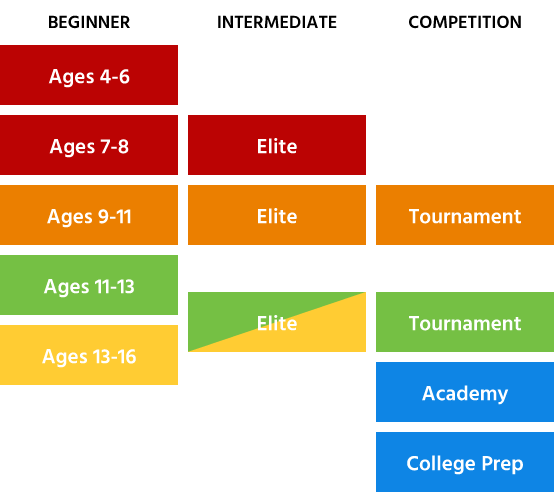 Orange Elite/Orange Tournament levels are for players who have more advanced skills and who are starting tournament play. Players are moved into these levels after passing skills assessment tests and with instructor approval. Orange Level is for players who are 9-11 years old, or players who have mastered the Red Level Competencies as determined by the coaching staff. Players learn on a 60 ft. court with orange compression balls and a 23″ or 25″ racquet. Classes meet once or twice a week. No more than 8 players per instructor. The emphasis is on court movement, basic stroke technique and match play. The program includes a once-a-week class, match practice on Sunday afternoons at 2:00 pm during the school year. We have Orange Level, Orange Elite, and Tournament Orange Level. Elite and Tournament Level are by invitation only. Our school year program features 8 week sessions for afternoon and Saturday classes. Classes start the first week of school and continue through the end of May. Program includes Sunday Match Day at 2:00 pm for all registered players. Players can register online or in the pro shop. Online registration requires setting up a family account with the tennis center. Weekly Classes taught Tuesday/Wednesday/Thursday 4:30-5:30pm and Saturdays at 9:30-10:30 am during the school year. Players attend once or twice a week. FREE Match Day every Sunday at 2:00 pm. Southlake Tennis Academy is a skills-based program that focuses on age appropriate development following the Orange Level Competencies Players need a USTA membership to play in USTA Tournaments, such as the Future Stars. Click on the link below to sign up for your first year FREE! FREE 10U USTA Membership For more information about the USTA Texas Section Junior Competition Pathway, please go to Texas Youth Tennis for a list of Texas Section tournaments and information about competitive play in Texas.